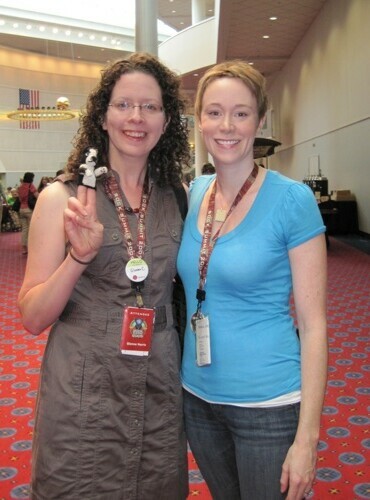 This morning I got up, got a Starbucks latte, and headed to the Oregon Convention Center. There, I chatted with Ravelry’s Jess and Stephanie Pearl McPhee before going on to classes with Janel Laidman, Meg Swansen and Amy Detjen. Then I bought yarn in the marketplace and went to the Opening Reception where, after a wonderful greeting by Stephanie and Tina, the entire reception room burst into spontaneous applause and standing ovations, and then we all hung out and talked and mingled and I shook Barbara Walker’s hand and had conversations with Lucy Neatby and Sivia Harding and Abby Franquemont and Ann Budd. 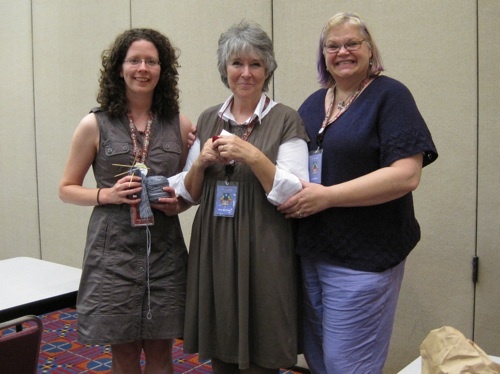 And then I talked to Deb Barnhill about toe-up socks until the room was nearly empty, and then we all went off to our separate crash pads hotel rooms, and now I’m having difficulty believing that all of this is actually happening to me. I suspect I am not alone in this. Day One of the Sock Summit has passed, and already I am having difficulty recalling everything I have absorbed and experienced so far. It is a singular thing, being here. Anything else I try to compare this to has some level of institutional formality or structured system of recognition or higher levels of impatience or air of…well, normalcy, that really has no place at Sock Summit. Everyone I have met so far – attendees, teachers, vendors – absolutely everyone has commented on how much this is unlike any other event they have attended. I am trying to think of another event or gathering that I can compare this to, and am coming up short. Everyone has a smile, everyone is game, everyone is knitting. Rebecca and I keep having conversations throughout the day and saying things like, “Hey, you know [X knitter] I met/took a class with/talked to/shook hands with is the nicest ever.” And then the other will respond with, “But you know who is also the nicest ever? 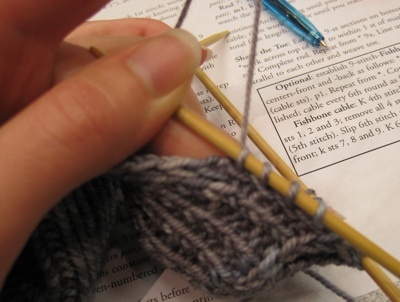 [Y other knitter] I met/took a class with/talked to/shook hands with.” And on it goes. And this goes for teachers, attendees, vendors, everyone. There are unlimited photos, conversations, and sock appreciation, and this weekend isn’t even half over yet. 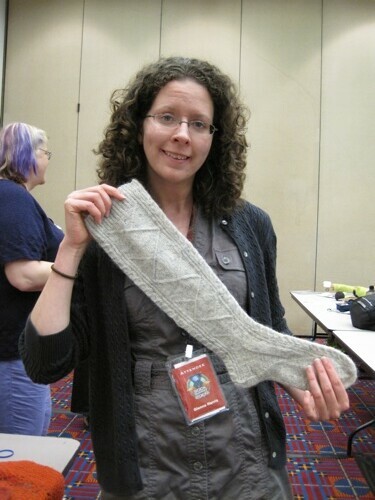 Today, I touched a sock knitted by Elizabeth Zimmerman. 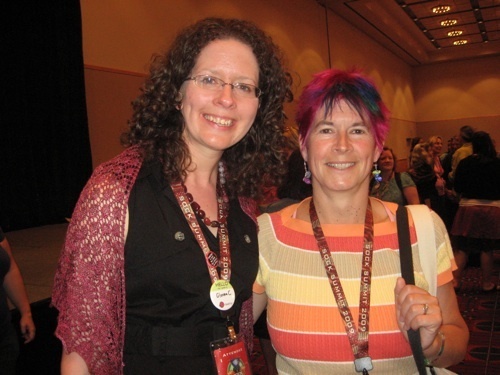 I learned about colour-work from Janel Laidman. 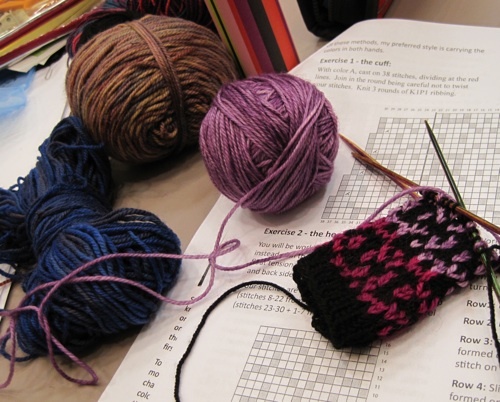 I learned about knitting socks from Meg Swansen and Amy Detjen. I listened as Stephanie Pearl McPhee and Tina Newton described the Sock Summit journey in alternating laughter, delirium, and tears. I met dozens of people and many new friends. 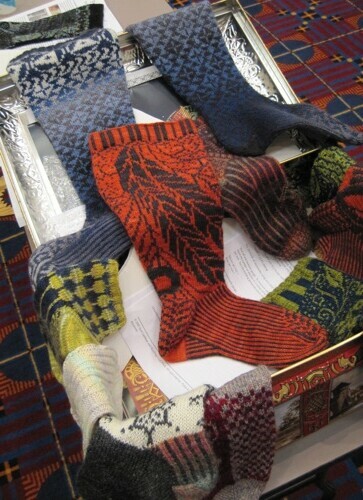 So far, Sock Summit is awesome. I live about a mike from OCC but wasn’t able to get into a class so am doomed to only attend tomorrow’s marketplace and a couple of the non class events. In the moments when I am not collapsing in paroxyms (sp) of green envy, I am grateful that you and other knitters like you are sharing through blogs, tweets, and photos. Thanks, from all of us condemned to the edges. If you left any yarn, I will see it tomorrow. Maybe I will be able to say I spoke to or shook the hand of GlennaC. Wow, wow and triple wow – is this even more amazing than you thought it would be? 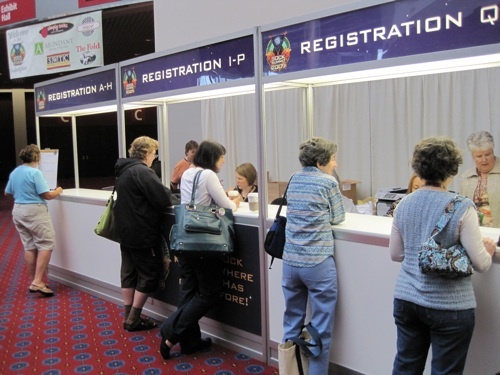 I love how the registration desks look just like those for the ‘academic’ conferences I attend as an exhibitor – I’ll be at that convention centre in October – same same and yet mind blowingly different! I’m almost speechless with amazement! Wow! 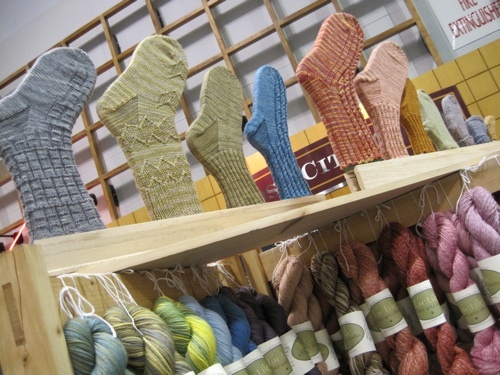 Great to hear the summit is the summum of sock knitting, shame there was no way I could be there (my green angel says it would be ungreen to fly out to the far end of the US for sock knitting, and my wallet says it was a no-go even without green angel’s interference). But many who did not make it there live vicariously through you! oh, so jealous. but also thrilled for you. looking forward to hearing/seeing more! I am delurking to thank you for sharing such great photos. It looks like soooooo much fun!!! Wish I could be there but am glad all of us can see a peek on your blog! OH MY GOD THAT IS MEG SWANSEN. JEALOUS JEALOUS JEALOUS. Have more fun! Post more pictures! Enjoy every second and keep up with the awesome posts. Thanks for the update Glenna! I’m GREEN with envy. Ooh, I’m envious. I might be at other conferences, and going to a wedding, and there might not have been the slightest chance that I could have gone, but boy, I’d like to be there. Isn’t Meg Swansen the BEST?! 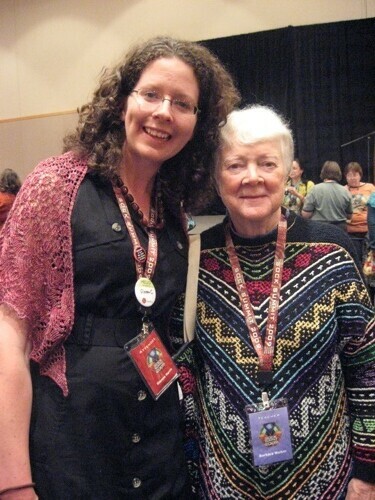 I got to meet her at the knit-in here in March, and I just loooooved her. Wow! Thank you for sharing… I am totally living vicariously through you! You lucky lucky girl. This looks like an amaaaaazing event. Have fun and keep us posted! Thanks so much for all the amazing photos. I am so envious, I almost can’t stand myself! Please mention to anyone who will listen that this fantastic event needs to happen again. And if it could be somewhere closer to Denver…I’m offering my guest room! I so appreciate the play by play your giving us sock summit-less. Thanks Glenna! Thank you, what a wonderful and oh so freaking cool ride you’re taking us all along on, THANK YOU! Good to see Swallowtail and hey.. the purple shawl, Lotus Blossom? I don’t even knit socks and I’m ridiculously jealous. I’d have loved to mill around the marketplace… Thanks for the photos though. Looks like a ton of fun! Wow! It sounds incredible. Thanks for describing everything so eloquently. I almost felt like I was there. Thanks for sharing your pictures! I’ve been reading (and enojying!) your blog for awhile and normally lurk. I’ll be at SS this weekend and will say hello if I run into you. 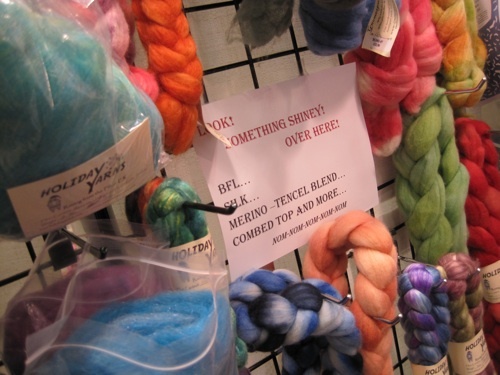 Next time you’re in the marketplace look for a yarn dyer named “Wool Candy.” She’s from Northern California and her yarn is GORGEOUS. I mean, I’m sure there is tonsandtonsandtonsandtons of gorgeous yarn but I am very fond of this yarn and the dyer. She’s a sweetheart! Can’t wait for more updates! OK. You’ve done it. I’m crying. Amazing! Blog loads about it so that we can see! WOW! The event looks amazing…Any luck of it jumping over the pond to Europe? Thanks for sharing. I’m looking forward to hearing more. I’m jealous beyond words….but also so excited that this event is even taking place. Enjoy every moment and keep the pictures and updates coming. OMG! It’s Amy Detjen! It is just so great to see her picture. 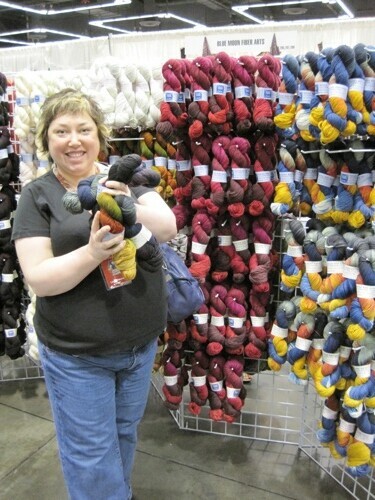 She was the former Knitlist “Mom”, and we still miss her. Also, she is a good friend from my home state of MN. Thanks for sharing! Can you believe it – Barbara Walker, too! Just too much for me to take in one day. Any chance of captions for those of us who have heard of many of these people but not googled/cyberstalked them enough to have faces? Any chance of there being a “SockSummit: Midwest”? Ever? ‘Cause that would totally rock…. Knit on, Glenna! We’re looking forward to further updates! Jealous! So glad you are having such an amazing time, but…..seething with envy at the same time. Wow, look at all those awesome socks!! NEATO! It’s fun to read your recaps of that amazing weekend, it sounds like you were experiencing similar emotions to me (and everyone!). I’ve just started posting my experiences on my blog with lots of BIIIIGGG photos if you want to see some! I didn’t get any photos of your totally awesome stockings, though, and I have to tell you that THOSE are the things that I want to knit first!